getting your wheels behind the wheel. Power Wheelchair Transfers can be a bear! You've noticed? Those TV ads look good! A nice power chair to gain your independence and then wham, you can't take it with you in the car! Yes you can! The equipment is straight forward...but can be very confusing and when you add up all the details (ramps, lifts etc) it can be depressing and expensive. Power wheelchairs offer more independence but can really limit you from actually getting out "on the town" and using it due to the transportation issue. 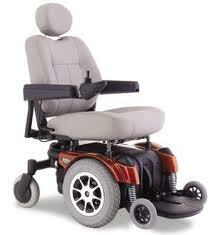 Mobility-advisor.com provides excellent resources for power wheelchair purchase considerations! Besides the little guys that come apart in 3 or 4 pieces (and do fit nicely in your trunk), you're not taking those battery powered wheels with the gas powered one unless you've got the right equipment. A power wheelchair lift work great fitting nicely onto the hitch of your car. Again, think through the logistics. Bottom line is that someone needs to be with you to manage the chair after you are in the car. Vehicles equipped with drive thru lifts work well but can be very costly. And if you are alone and thinking that this will solve the transport problem. Remember that after you get into the van IN your power chair, someone needs to close the door (if it doesn't close by itself) and YOU need to get to the drivers seat if you are driving. The logistics alone can keep anyone home. Most often I see someone else driving the van and transporting the patient still in the secured chair. But, it's just something to think about. Again, a big expense! On the lighter note (in this economy!) a power chair rack is penny's compared to a power chair accessible van. And even lighter than that (pocketbook wise), is the folded wheelchair ramp that allows your chair to be driven into your truck bed or into your van. Check van height clearance though... spatial orientation is not everyone's strength! Internal lifts store inside your vehicle and "boom" out to pick up your chair and lift it inside. Both kinds are very convenient and a luxury to have however, I can't say it enough, pay attention to the logistics. If you are confined to a wheelchair, someone has to take the chair back to the lift and get the chair back out and bring it to you... think it through. Some can manage just fine alone, others will not be able to. Think it though and save your money if you can't go at it alone. Power wheelchair transfers - getting from the chair to the vehicle are much the same as manual wheelchairs. The basics are the same. The difficult part can be the power wheelchair transfer into or onto the vehicle so that you can actually be mobile once your reach your distination. Power wheelchair transfers into the car will require some type of lift whereas, putting a manual wheelchair in the car can be relatively simple. No matter how you slice and dice it, you'll either need a ramp or you won't...give it careful thought.